The World is on your hand with Nokia N80. 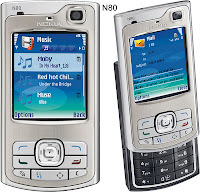 Nokia N80 is a quadband GSM 3G device boasting email, personal organizer, MP3 player and 3 megapixel camera. So you can talk in pictures, meet everyone in overseas.